I am writing today’s installment on the train from Madrid to Pamplona. It is proving to be a very pleasant way to travel and take in the scenery, which is reminiscent of Eastern Washington. It is very dry and sparsely populated almost from the moment we left Madrid. After finishing yesterday’s journal entry, I purchased a two day city tour bus pass (senior discount!) and rode around Madrid getting a bird’s eye view. I then walked until I was tired enough to call it a day. I managed to stay awake until around nine, and then retired. To my surprise, I awoke at 2 am feeling fully refreshed. I force myself to stay in bed, and the next thing that I knew, it was 9 am. Much better. I think that I am now on Spanish time. After a good breakfast, I resumed my bus tour. I hopped off at the Plaza Mayor and happened upon the Mercado de San Miguel. This was a bustling covered market full of vendors of specialty food items intended primarily for on-site consumption. They had everything from a selection of caviars to exquisite pastries, olives to hams, fresh seafood to pasta. 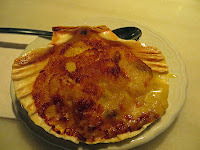 I lunched on fresh gazpacho and a dish I know only as “coquilles St. Jacques” – I don’t know the Spanish name for it. This was very appropriate for my visit, since the symbol of the Camino de Santiago pilgrimage is the scallop shell. After this respite, I resumed my travels by foot, making it back to the Palacio Real where a formal military parade (which I had seen from the bus) was still underway. 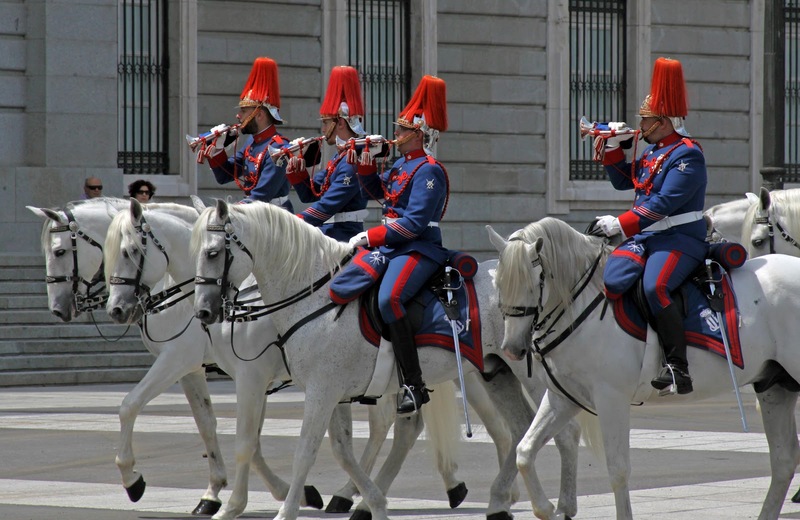 There were bands and cavalry, all in dress uniforms. I don’t know the occasion for the celebration, but it was very picturesque. By now it was almost two, so I made my way to the hotel, collected my luggage and took a taxi to the station for my three o’clock train. As we neared Pamplona, I missed what could have been a great photo. Out the train window, I saw a fit cyclist, traveling with a complete second bicycle on his back. For the rest of the trip I tried to imagine the scenario: Did he always carry a spare? Was he carrying the bike for a companion after a mechanical problem? (Where was the companion?) Was he taking it to a friend who would ride with him?